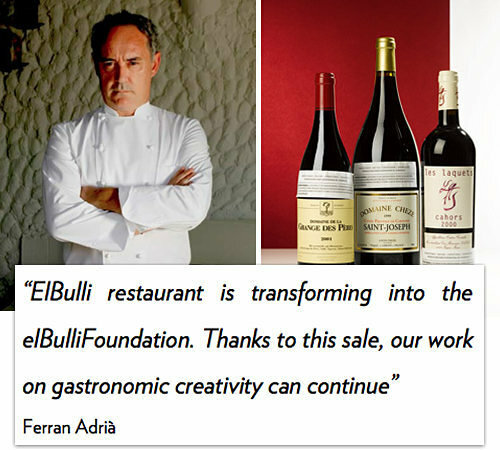 More than 8,800 bottles of wines from the cellar of Spain’s world-renowned elBulli restaurant will be auctioned in Hong Kong and New York next year in sales that could exceed $1 million, Sotheby’s said on Wednesday. The award-winning restaurant, headed by celebrated chef Ferran Adria for 27 years, was regarded by many as the best restaurant in the world. Before closing last year to make way for the elBulliFoundation which will open in 2014, the restaurant had earned three Michelin stars among numerous other accolades for its gastronomic inventions and unusual dishes. Proceeds from the sales will benefit the foundation.